Ubisoft announced today they are in the process of remastering the Michel Ancel adventure game Beyond Good & Evil. The game originally was released in 2003 on Gamecube, Xbox, PlayStation 2, and PC. The remaster, titled Beyond Good & Evil HD, is tentatively scheduled for a 2011 release as a downloadable game on the PlayStation Network and Xbox Live Arcade. Ubisoft said the new version will run at 1080p resolution and feature updated character models, high-res textures, and a remastered soundtrack, along with the inclusion of Trophies and Achievements. 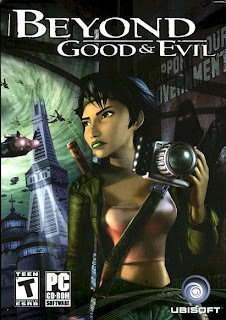 Beyond Good & Evil was well received when it was originally released, garnering critical acclaim and awards. However, it was not a commercial success. It was released in time for the 2003 holiday season but quickly saw its price cut due to poor sales. Ubisoft did not put much marketing behind the game, and its odd premise didn’t lend itself to heavy advertising. I’ve never played Beyond Good & Evil, but I’ve heard from many that it is one of their top games of all time, and that it stands shoulder-to-shoulder next other great games like Psychonauts, so now might be a great time to play. Gameplay is decribed as Zelda-ish during the Zelda 64 age. It currently is available on Steam for PC and playable in higher resolutions but I’ve heard controls are wonky, not customizable, and that it feels like a clumsy port. During the Ubidays 2008 conference it was announced that work begun on Beyond Good & Evil 2. Although currently in development, there is no word on when it will be released. No news about a release date after more than 2 years of development lends itself to vaporware, but we all saw how that turned out with Duke Nukem Forever.